The way they played Sunday, the Bucs should have never gotten off the bus. Alex Smith tied a career-high with three touchdown passes and the 49ers had their largest margin of victory in the regular season since 1987, rolling over the Buccaneers, 48-3. The Bucs allowed Smith to go 11-for-19 passing for 170 yards while Frank Gore ran for 125 yards and a score on 20 carries for the 49ers (4-1), who have won three straight to produce their best start since 2002. “Another strong game by Frank (Gore). I thought he was seeing things well today, seeing holes, planting very well,” San Francisco head coach Jim Harbaugh said. Josh Freeman struggled as he went just 17-for-33 with 187 yards and two interceptions for the Buccaneers (3-2), who had a three-game winning streak stopped. LeGarrette Blount accumulated only 34 yards on 10 carries, while Kellen Winslow caught five balls for 54 yards. The 49ers struck first as Smith found Delanie Walker for a 26-yard touchdown pass to conclude their opening four-play, 50-yard drive. Tampa Bay took 6:28 off the clock on their ensuing possession as Connor Barth booted one through from 24 yards out. Arrelious Benn had a 33-yard catch to highlight the drive. Carlos Rogers intercepted Freeman on the first play of the second quarter and he returned the pick 31 yards into the end zone to make it 14-3. Freeman was picked off again on the Buccaneers’ ensuing drive as rookie Chris Culliver undercut the intended receiver Michael Spurlock. The 49ers capitalized as they turned the turnover into a touchdown when Gore ran it in from two yards out. David Akers tacked on a 37-yard field goal with 4:29 until the half to make it 24-3. San Francisco opened the second half with another touchdown as Vernon Davis got into the end zone on a 23-yard catch-and-run. Josh Morgan had a 24-yard catch, while Michael Crabtree hauled in a 15-yard reception to highlight the seven-play, 80-yard march. The Buccaneers were unable to convert a 4th-and-2 at the 49er 33-yard line as Freeman’s lob pass for Mike Williams fell incomplete. Akers proceeded to nail his second field goal of the game, this time from 27 yards out, as the 49ers increased their lead, 34-3. Dashon Goldson made a bone-crunching hit to force a Williams fumble after an eight-yard completion. 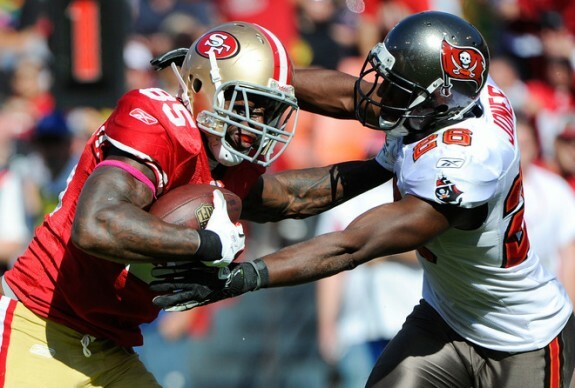 Patrick Willis recovered the loose ball at the Buccaneers 36-yard line. Smith connected with Davis for a second time as he corralled a 14-yard pass on the first play of the fourth quarter. Colin Kaepernick made his NFL debut at the 8:24 mark of the fourth quarter. After Kendall Hunter broke off a 44-yard run, Kaepernick completed his first NFL pass to Walker for an 11-yard gain. Morgan caught a pass from Kaepernick and rumbled to the Buccaneers one- yard line for a 19-yard gain before being dragged down awkwardly on his right leg. He had to be carried off the field as he wasn’t able to put any pressure on the leg. He was carted back into the locker room. Anthony Dixon added to the San Francisco lead with a one-yard touchdown plunge. Tampa was brutally beaten and left bleeding profusely in a dark alleyway! their skills are primitive and useless against the 49ers! how dare they challenge the niners with their feminine gestures! Freeman is a young sissy girl! They should be ashamed of themselves for taking the field against a far superior team. They have disgraced themselves and their families for generations to come! NINERS!!! !